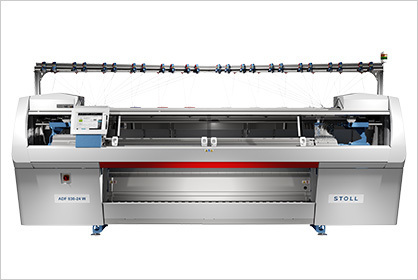 Next July STOLL presents the new ADF 830-24 W. This new member of the ADF family will be introduced to the public for the first time at the international textile exhibition in Shanghai, the ITMA ASIA + CITME 2018. Whether large textiles, oversizes, unusual cuts or long patterns - with the ADF 830-24 W and a working width of 84 inches various textiles for fashion or technical textiles can be realized. The ADF 830-24 W is equipped with the innovative STOLL-weave-in® technology. This allows knitting of textiles with weave-like optics and properties. A product advantage that directly affects form, comfort and flexibility: unlike traditional knitwear, weave-like textiles are more stretchable and more comfortable depending on the type of knit. In addition, they can already be preformed in the machine and provided with 3D elements. Based on the successful ADF technology, the ADF 830-24 W also scores with the yarn carriers, which are independent of the carriage and allow a particularly high degree of flexibility. Each pair of them is mounted on a total of 12 tracks on the ADF 830-24 W and can be moved both horizontally and vertically, can be easily programmed and quickly equipped with yarn. The EKC operating system completes the modern equipment: It facilitates the operation, since it is intuitive and can be learned without much training effort. The ADF 830-24 W represents a user-friendly gain for textile production - from day one.